NOTE: The photos accompanying this review were taken from various online sources and do not reflect the quality of the Blu-ray under review. For anyone who has ever fancied themselves an artist -- for reasons justified or otherwise -- Paul Mazursky's semi-autobiographical film Next Stop, Greenwich Village (1976) is sure to strike a chord. With its fond but not always flattering look back at la vie bohème in Beat-era New York, Mazursky has made one of the great grown-up coming-of-age films. 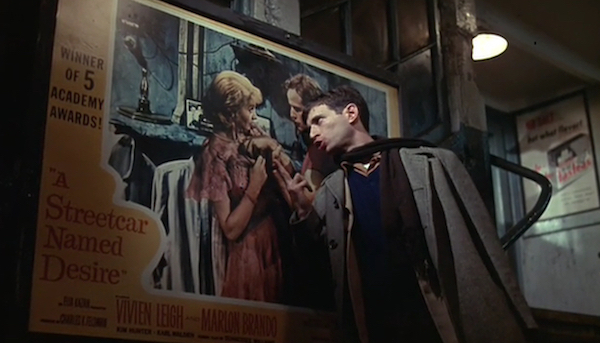 Stage actor Lenny Baker appears in his only film lead (he died in 1982) as Mazursky's 1953 stand-in, Larry Lapinski, a nice Jewish boy who takes the long subway ride from Brownsville, Brooklyn, to Manhattan's Greenwich Village, to seek fame as an actor. 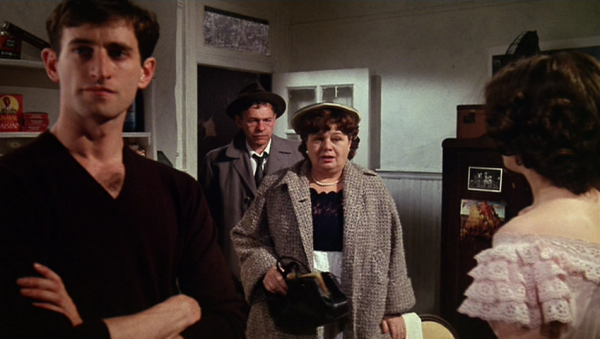 Shelley Winters is his meddling mama Faye, who fears her boy is being thrown to the downtown wolves. Their Oedipal dynamic is ever-present -- Faye flips out when Larry's girlfriend Sarah (Little Shop of Horrors' Ellen Greene) admits to sleeping with her boy; later, Larry has a dream about kissing his mother in acting class -- but what could be a cartoon of a grasping Jewish mother is given gravitas by the underlying sadness of Winters's performance and the suggestion by Mazursky's script that Faye would have been an artist too, if such a thing were imaginable in her life. In Greenwich Village, Larry finds a community. Christopher Walken (credited here as "Chris") is a self-styled poet with a wandering pee-pee. Lois Smith is a depressed failed actress who constantly theatens and sometimes attempts suicide; Lois's self-ending impulses become such a common routine that the others, led by sort-of den mother Connie (Dori Brenner), treat each new cry for help as a cause for impromptu partying. Antonio Fargas is a Jason Holliday-style hustler whose life-of-the-party attitude unsurprisingly masks some hidden pain and traumatic history. Next Stop, Greenwich Village is most successful at evoking a specific time and place. From the art poseurs and weirdos who populate the film's ensemble scenes in bars and coffee houses to the emotional growing pains of Larry and Sarah's relationship, it's lived-in. It's real. Mazursky's script is not only wry and cleverly observed, but the cast does an unparalleled job of bringing heart and humor to this remembered reality. Next to the main ensemble, Lou Jacobi has a memorable supporting part as the crotchety owner of the health food store where Larry works. Mike Kellin is Larry's tight-lipped father, who has clearly had to mediate between mother and son for years. Jeff Goldblum is brilliant as a supercilious actor -- he's studying with "Lee" at the "Studio" -- that Larry meets at auditions. Joe Spinell has a nice bit as a beat cop who watches Larry perform an Oscar acceptance speech to an empty subway platform before suggesting the kid's patter needs a little work. It's also fun to glimpse Bill Murray and Vincent Schiavelli in the periphery of a few scenes. It honestly beats me why this film isn't better known these days. Like much of Paul Mazursky's work, it's smart, original, and elegantly made. Here's hoping this release at least somewhat grows the cult of fans for this deserving little film. Next Stop, Greenwich Village comes in a limited edition of 3000 copies. The disc is packaged with a color booklet, featuring a liner note essay by Twilight Time's Julie Kirgo. Shot by Serpico DP, Arthur Ornitz, Next Stop, Greenwich Village has a distinctly shot-on-location New York flavor without resorting to pseudo-verité style. The visual style hits the right note of unsentimental nostalgia. This AVC-encoded 1080p 1.85:1 presentation does a perfect job of translating this look. Not too grainy, not too soft. Excellent clarity and nicely saturated colors. No noticeable damage or digital encoding hiccups. A great upgrade. Twilight Time offers two options, DTS-HD MA 2.0 stereo and the original DTS-HD MA 2.0 mono. Since this is a largely dialogue-driven movie, there's not a world of difference, although the stereo better serves the jazz needle-drops (lotta Brubeck) and sporadic score by Bill Conti. No flaws or damage. One subtitle option: English SDH. Audio commentary by director Paul Mazursky and actor Ellen Greene - Ported over from the 2005 DVD. Mazursky and Greene were recorded separately, but they both offer warm and worthwhile recollections of their time making this film. Isolated music track - in DTS-HD MA 2.0 stereo. For my money, this is the best film in Paul Mazursky's underrated oeuvre. The pairing of a sharp script and a knockout cast of rising (and shoulda-been) stars makes this one irresistible. Fox and Twilight Time have done a nice job giving the flick an A/V upgrade, so now is the perfect time to check it out. Highly Recommended.